You scored ' + correctAnswers + '/' + killers.length + ' correctly. 02. What happened at Ghadir-e-Khumm? 03. When & in front of how many Muslims? The map shown is the map of Arabia. Ghadir is on the way from Mecca to Madina. While returning from Mecca to Madina, after the last hajj, alongwith his companions, the Holy Prophet (S.A.W.) broke the journey at a lake, 3 miles away from Al-Johfa. He (S.A.W) halted at midday in a wayside tract of barren land with no shade other than that provided by a few acacia trees. A small lake is called as Ghadir in Arabic, so this place is known as Ghadir-e-Khumm. The name Ghadir is no longer in use. "O my people! I am going to be recalled shortly and I must comply. I shall be interrogated and you also shall be interrogated. What will you say then?" The entire audience answered: "We shall bear witness that you did convey to us the message of Allah, and tried your best to guide us on the right path and always gave us good console. May Allah bless you with a good reward." The Prophet proceeded: "Why do you not bear witness that there is no god but Allah and that Muhammad is His slave and Messenger, and that Paradise is true, Hell is true, Death is true, Resurrection after death is true, that the Day of Judgment will doubtlessly come and that Allah will raise to life the dead from their graves?." They said: "O Yes! We bear witness to all this." Then he said: "O Allah! You also may witness." Then he said: 'O my people! Allah is my Mawla and I am mawla of the faithful and I have superior right on and control over their lives. And this Ali is the mawla of all those of whom I am mawla. O Allah! Love him who loves him and hate him who hates him." He further said: "O my people! I will precede you and you also shall arrive at the pool of Kawthar, the pool wider than the distance between Basrah and San'a', and there are on the pool as many goblets of silver as stars. When you shall reach me I shall interrogate you about your behavior towards the two in-valuable assets after my death. The major asset is the Book of Allah, the Mighty and Glorious, one end of which is in the hand of Allah, the Exalted, and the other end of which in your hands. Grasp it tightly and do not go astray and do not change or amend it. The other asset is my Progeny, who are my Ahl al-Bayt. Allah the Gracious and Omniscient has informed me that the two will not part from each other before they reach me at the pool. 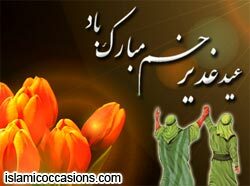 This Ghadir-e-Khumm event happened on the 18th of Dhil-Hijjah (1410 AH), in 10 Hijra in front of nearly one hundred thousand (100,000) Muslims. While returning from the last hajj (Hajjatul-wida / farewell pilgrimage) of our Holy Prophet (S.A.W.). Imam Ahmad has recorded the tradition related by Bara' ibn 'Azib in his Musnad, vol.4, p. 281, transmitted through two different sources. Bara' says: "We were with the Messenger of Allah. We alighted at Ghadir-e-Khumm. Congregational prayer was in order. An area under two trees was swept and cleaned for the Messenger of Allah, Allah's blessings and peace be upon him and his posterity. He offered midday prayers and he grasped the hand of 'Ali and said: 'Do you not know that I have superior authority over the lives of the faithful than the faithful themselves?' 'Yes you have,' they replied. He again inquired: 'Do you not know that I have superior right to the life of every believer than the believer himself?' 'Surely, you have,' they answered. Then he grasped the hand of 'Ali and said: 'Ali is the mawla of all those of whom I am mawla. O Allah! Love him who loves him and hate him who hates him.'" Bara' ibn 'Azib says: "Then 'Umar came to 'Ali and said: 'Congratulations to you the son of Abu Talib. You have become the mawla (master) of all the faithful men and women.'" Here we will just mention one instance which took place in Kufa during the khilafah of Imam Ali (A.S.), 25 years after the Prophet's death. When at Ali's insistence a large number of people gathered in the plain of Rahbah in Kufah, he addressed them saying: "I administer an oath in the name of Allah to all such Muslims as heard the Holy Prophet (S.A.W.) making a proclamation on the day of Ghadir-e-Khumm, to stand up and testify what they heard him say. Only those who saw the Holy Prophet that day with their own eyes and heard the proclamation with their own ears should stand up." Thereupon, thirty companions of the Holy Prophet(S.A.W), including twelve of those who had participated in the battle of Badr, stood up and witnessed that the Holy Prophet(S.A.W) grasped his (Ali's) hand and said to the audience: "Do you know that I have a prior right to and superior authority over the souls (i.e., lives) of the faithful than the faithful themselves?" "O yes!" they said. The Holy Prophet (S.A.W.) then said: "He (Ali) is the mawla (i.e., has prior right to and superior authority over the lives) of all those of whom I am mawla. O Allah, love him who loves him (Ali) and hate him who hates him." It is logically impossible that thirty companions might have secretly agreed to speak a unanimous lie. In addition to the thirty witnesses there were other male companions whom enmity with Ali prevented from standing up and giving their evidence as eye-witnesses, like Anas ibn Malik. When Ali (A.S.) said to Anas: "Why do you not stand up and testify what you heard from the messenger of Allah on the day of Ghadir?" he answered, "O Amir al-Momineen! I have grown old and do not remember." Thereupon Ali said: "May Allah mark you with a white spot (of leprosy) unconcealable with your turban, if you are intentionally withholding the truth." And before Anas got up from his place he bore a large white spot on his face. Thereafter, Anas used to say: "I am under the curse of a righteous slave of Allah. Also bear in mind that this incident took place 25 years after the event of Ghadir Khum, and during this period hundreds of eyewitnesses had died naturally or in the battles fought during the first two khulafah's rule. Add to this the fact that this incident took place in Kufa which was far from the centre of the sahabas, Medina. This incident which took place in Kufa in the year 35 A.H. has itself been narrated by four sahaba and 14 tabi'un and has been recorded in most books of history and tradition. 1: Abaqat al-Anwar a book written in Persian by Allama Mir Hamid Husayn al-Musawi (d. 1304 AH) of India. Allama Mir Hamid Husayn has devoted two bulky volumes (consisting of about 1,080 pages) on the isnad, tawatur and meaning of the hadith of Ghadir. 2: Al-Ghadir in 11 volumes in Arabic by Allama Abdul Husayn al-Amini where he gives with full references the names of 110 sahaba of the Prophet and also 84 tabi'un (disciples of the sahaba) who have narrated the hadith of Ghadir. He has also chronologically given the names of the historians, traditionists, exegesis's and poets who have mentioned the hadith of Ghadir from the first until the fourteenth Islamic century. Rememeber the Ahlul Bayt by saying of Salawat as many times as it is possible. (O Allah, send blessings on Muhammad and his household). Istighfaar (seeking forgiveness from the Almighty). Sins are forgiven and believers get salvation on this day the way it has been promised for the days of Holy Ramadhan and the night of Qadr. Visiting (ziyarah) the tomb of Imam 'Ali (A.S.) in Najaf, Iraq. Assist the needy amongst the believers. The reward for assisting today is 1000 times the reward for other days. Ihsaan for fellow believers (doing good, including favouring by assisting physically, financially and morally) and making them happy (for example by forgiving their past mistakes, overlooking their slips, visiting them, giving gifts etc). Doing of Ghusl a few minutes before noon (midday) and then reading two rakaat Namaz. In every rak'ah after suratul Hamd read 10 times suratul Tawheed (#112) and 10 times Ayatul Kursee (verses 255 to 257 of suratul Baqarah)and 10 times suratul Qadr (#97). For more information on the event of Ghadir Khumm click here.